Do interactions with LGBT individuals in medical school predict less sexual orientation bias? 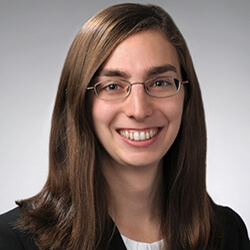 In a study presented at the 2019 Society for Personality and Social Psychology convention, Natalie M. Wittlin and colleagues examined the relationship between early-career physicians’ interpersonal experiences during medical school and their biases against lesbian and gay individuals two years later, during residency. The more they had interacted with LGBT individuals during medical school, the less bias against lesbian and gay individuals they reported during residency. The more positive their interactions with LGBT individuals during medical school had been, the less bias against lesbian and gay individuals they reported during residency. Those who had heard physicians make negative comments about sexual minority patients during medical school reported higher levels of bias against lesbian and gay individuals during residency. Interacting with LGBT individuals during medical school may produce lasting reductions in bias against lesbian and gay individuals. Witnessing role models make disparaging remarks about LGBT individuals, however, may produce sustained increases in bias. Do rates of burnout and career choice regret among resident physicians vary by clinical specialty? In a paper in JAMA: The Journal of of the American Medical Association, Dr Lisolette Dyrbye and colleagues explored factors associated with symptoms of burnout and career choice regret during residency. Burnout was prevalent in the sample (45.2%) but varied substantially by clinical specialty, with residents in urology, neurology, emergency medicine, ophthalmology and general surgery reporting more burnout. Female residents had a 7.6% higher risk of burnout than male residents. Most resident physicians were satisfied with their career and specialty choice. 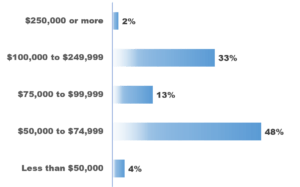 However, career choice regret was reported by 14.1% of the sampled residents, and was highest among residents in pathology, radiology, and anesthesiology. Residents with higher anxiety and lower empathy during medical school were at greater risk of subsequent burnout and specialty choice regret during residency. The authors recommend further research to better understand differences in burnout and career choice regret among US resident physicians. 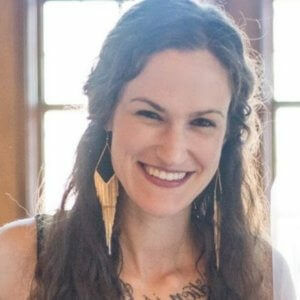 In a study published in Social Psychology Quarterly, Dr. Sara Burke and colleagues examined the effects of both formal and informal experiences on non-African American medical students’ attitudes toward African Americans. Interracial contact was an important predictor of positive attitudes toward African Americans. Students who witnessed instructors make negative racial comments or jokes were significantly more willing to express racial bias themselves. 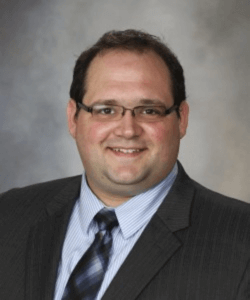 In a study published in the Journal of General Internal Medicine, Dr. Sean Phelan and colleagues examined how medical school curriculum, role modeling, diversity climate, and contact with sexual minorities predict bias against gay and lesbian people. In medical schools where faculty discrimination against LGBT patients was more common, students experienced an increase in bias toward gay and lesbian people over the course of medical school. Students who felt more prepared to care for LGBT patients had lower bias toward gay and lesbian people. Both the amount of contact with sexual minorities and the perceived quality of that contact were associated with reduced bias during medical school. 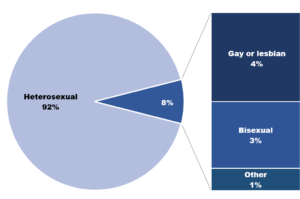 Medical student biases toward sexual minorities may improve during medical school with training in providing care to sexual minorities, improved diversity climate, less negative role modeling, and more favorable interaction with sexual minorities. Does a negative medical school diversity climate impact the depression scores of medical students? 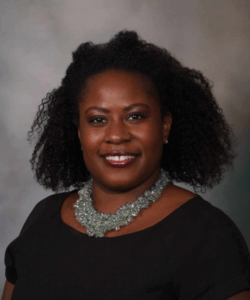 In a paper published in the Journal of the National Medical Association, Dr. Rachel Hardeman and colleagues examined whether students’ perceptions of their medical school diversity climate was associated with an increase depression symptoms over the course of medical school. Nearly two-thirds of students reported exposure to a negative racial climate at their medical school, particularity witnessing racial insensitivity from other students or faculty. Most students also reported witnessing discrimination towards other students (81%) and negative role modeling (94%). Negative racial climate, witnessed discrimination, and negative role modeling were independently and significantly associated with an increase in depression symptoms during medical school, even after controlling for students’ personal experiences of mistreatment. A negative diversity climate is harmful to all students regardless of race, and is particularly detrimental to Asian students. Medical Student CHANGE & Medical Trainee CHANGE Studies were funded by two R01 grants from the National Heart, Lung and Blood Institute, National Institutes of Health*. The study was originally conceived by Michelle van Ryn, PhD (Principal Investigator) and John (Jack) Dovidio, PhD (Yale Site Investigator) in order to determine whether medical training factors had an impact on physician biases and/or equity of care. While there is clear evidence of disparities in health care and compelling evidence that provider bias contributes to a portion of these disparities, there is a dearth of research evidence regarding the individual and medical school/residency factors that increase or decrease the likelihood of new provider implicit and explicit bias. This study is designed to fill this gap in knowledge and to inform the development of effective interventions to reduce bias among emerging physicians. 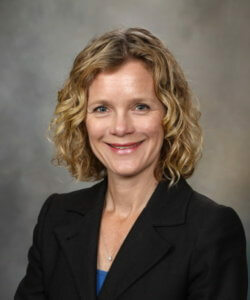 The primary purpose of the studies is to examine the impact of medical school and residency organizational climate, role model behavior, and formal and informal training experiences on new physician biases and characteristics (well-being, attitudes, and practices) associated with disparities in care. The secondary purpose of the studies is to examine the impact of medical school and residency characteristics on outcomes among new physicians who are members of marginalized social groups (under-represented minority, sexual minority, and have obesity). 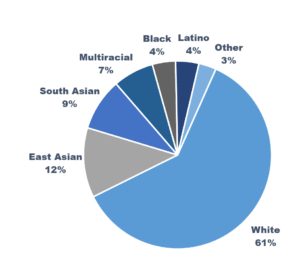 What were the demographic characteristics of the CHANGE Study cohort in 2017? Sample size: 3,058 third year residents participated in the CHANGE Study in 2017. Gender: 49% of participants identified as men and 51% identified as women. Age: the mean age of the participants was 29.8 years old (standard deviation 2.4 years). The youngest participant was 26 and the oldest was 55. 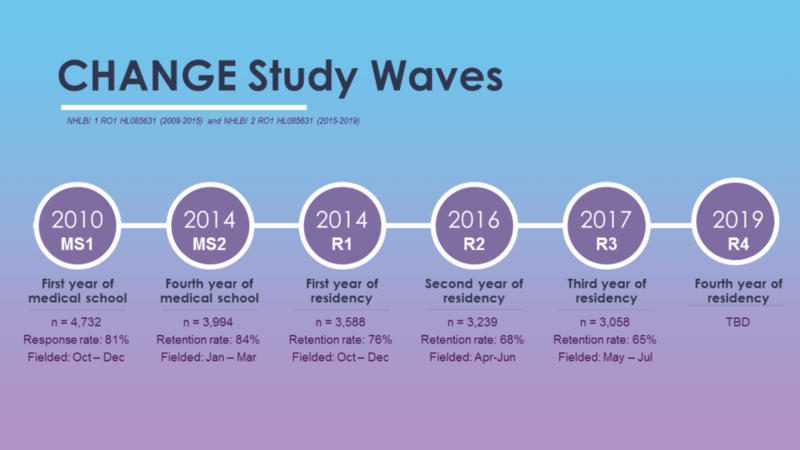 How does the CHANGE study sample compare to medical trainees nationally? 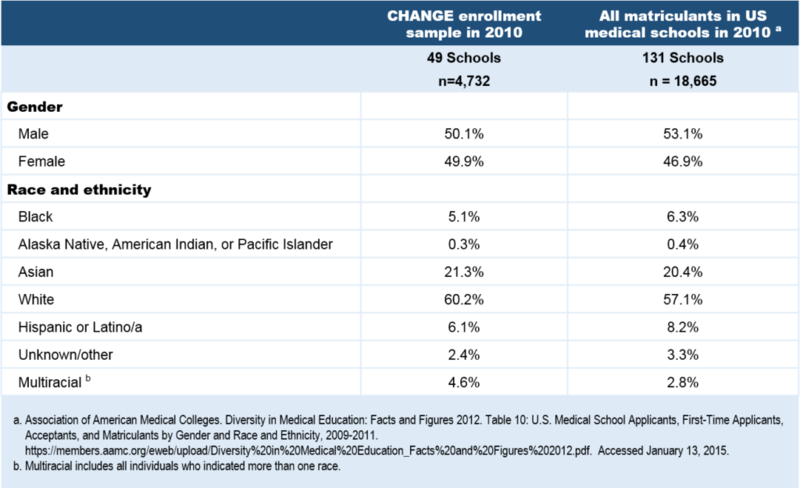 The demographics of the first year students in the CHANGE baseline sample were similar to the demographics of all students who matriculated at US medical schools in 2010. Association of Clinical Specialty With Symptoms of Burnout and Career Choice Regret Among US Resident Physicians. (2018) Dyrbye LN, Burke SE, Hardeman RR, Herrin J, Wittlin NM, Yeazel M, Dovidio JF, Cunningham B, White RO, Phelan SM, Satele DV, Shanafelt TD, van Ryn M. JAMA, 320(11), 1114-1130. Factors Influencing Medical Student Self-competence to Provide Weight Management Services. (2018). Doshi RS, Gudzune KA, Dyrbye LN, Dovidio JF, Burke SE, White RO, Perry S, Yeazel M, van Ryn M, Phelan SM. Clin Obes. A Prognostic Index to Identify the Risk of Developing Depression Symptoms Among U.S. Medical Students Derived From A National, Four-Year Longitudinal Study. (2018) Dyrbye LN, Wittlin NM, Hardeman RR, Yeazel M, Herrin J, Dovidio JF, Burke SE, Cunningham B, Phelan SM, Shanafelt TD, van Ryn M. Acad Med. Are data available for download? Currently data are not available for download. However, we invite those interested in working with CHANGES data to contact us about becoming a guest investigator. How can I become a guest investigator? If you’re interested in becoming a guest investigator, we welcome you! We have established a set of guest investigator policies to ensure that all study products have the highest scientific integrity and to maintain inclusive and collegial collaborations. Close collaboration with a core CHANGES investigator (i.e., “sponsorship”). Submission of a signed data use agreement. Submission of current human subjects research training documentation. Submission of a Paper Proposal Form. Participation in at least two CHANGES team video-conferences. Commitment to following study rules and procedures for scientific integrity, data security, and collegiality.